A knockoff of the world's largest search engine Google has appeared in China. The website, called "Goojje," opened on Jan. 14, just after Google threatened to pull out of the Chinese market complaining about censorship and hacking attacks on e-mail accounts of Chinese human rights activists. Over the next two weeks, around 40,000 people visited the site. The Chinese website replaced the last three letters of Google with "jje," which rhymes with the Chinese word for older sister, while "gle" sounds like the Chinese word for older brother. 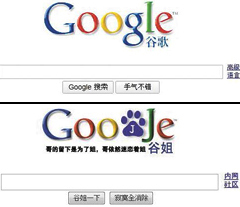 The Goojje logo copies parts of Google and a Chinese Internet portal called Baidu. Goojje performs simple search functions and offers a directory service that guides people to Chinese websites, chat boards and Internet polls. The Henan Business Daily on Wednesday said Goojje was created by around 20 Chinese web surfers. People in China believe Goojje was created by web users who would sorely miss Google.